Streets of Fire: Bruce Springsteen in Photographs and Lyrics, 1977-1979. By Eric Meola. Now ON SALE for 20% off! This is the standard hardcover edition, a 10"x10" book with dust jacket, released September 25, 2012. An intimate, behind-the-scenes look at Bruce Springsteen from the Darkness on the Edge of Town era. 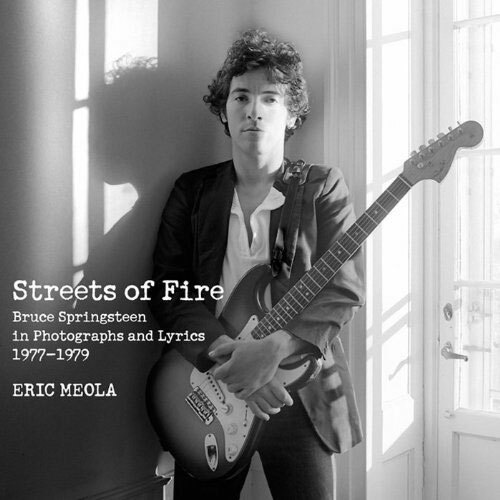 This collection includes more than seventy black-and-white photographs by photographer Eric Meola, lyrics by Bruce Springsteen, and an essay by Joyce Millman. Meola first saw Bruce Springsteen perform in 1973 at New York's legendary club Max's Kansas City. He began photographing Springsteen the following year, just before the release of his breakthrough album, Born to Run, for which Meola shot the iconic album cover art. Meola continued photographing Springsteen throughout his early career, most notably from 1977 through 1979, when Springsteen was emerging as a bona-fide rock star. This carefully curated collection of images gives us a revelatory look at Springsteen as he was coming to terms with his newfound success and creating the music for his fourth album, Darkness on the Edge of Town. Complete with an introduction from Meola, an insightful end-of-book essay by Joyce Millman, and running lyrics to several of Springsteen's songs, this book also shows how Meola's evocative portraits reveal Springsteen as he really was -- an artist at the crossroads of his fledgling career, writing about dark themes and finding redemption through his own words and image.